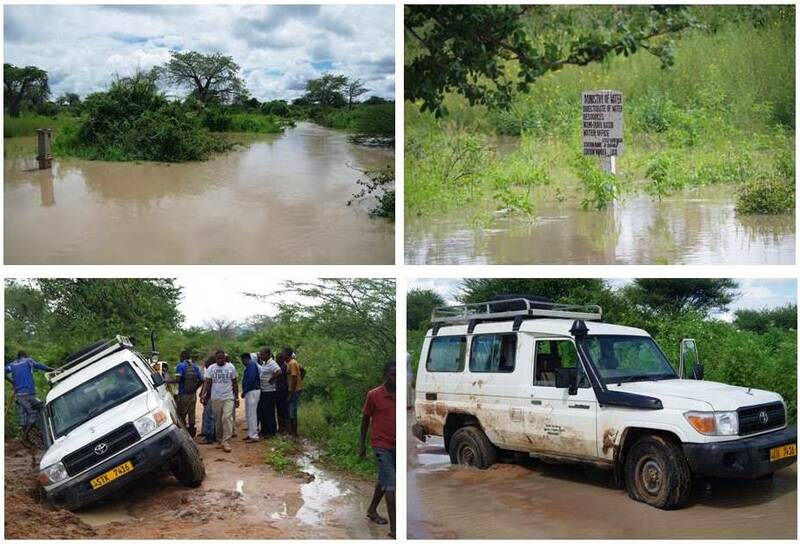 On April 4th and 5th 2016, members of the GroFutures Team visited the Makutapora Wellfield in central Tanzania to observe up close and with project partners, WamiRuvu Basin Water Office of the Ministry of Water, rare flood conditions that are associated with the 2015-16 El Niño Event and, it is expected, conditions favourable for episodic replenishment of the wellfield by recharge. In advance of the El Niño Event, the GroFutures Team established high-frequency sensors to monitor both surface water and groundwater levels resulting from what was expected to be anomalously heavy rainfall associated with the 2015-16 El Niño Event. The team was not disappointed by the rain but road conditions did present challenges to the downloading of data from installed sensors! After getting stuck twice in the very wet roads, the team will return again later in the year when conditions are drier. Nevertheless, a lot was learned from seeing the wellfield basin in flood. © Copyright 2019 GroFutures. All rights reserved.